420 Glide Natural Premium Hemp Seed Shave Oil – The Art of Superior Shaving Secrets. Scented with [Lavender/Lemongrass] – 1oz. The expert blend of essential oils in 420 Glide creates an amazingly comfortable, smooth shave that maintains the skins moisture levels and absorbs quickly without clogging pores. This specialty blend starts with hemp seed oil, and then combines other cold pressed seed & essential oils for a skin glide like never before. 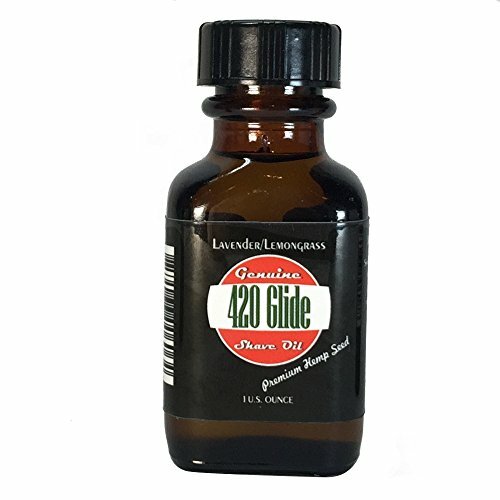 420 Glide’s oils are known to protect the skin’s moisture; all while increasing its elasticity. The Vitamins A & E immediately sooth irritated and itchy skin, as the antioxidants and proteins help restore your skin. Shave oil replaces shaving foam, soap, cream, pre-shave balm, aftershave and even beard oil. It dramatically reduces razor burn, nicks, bumps and ingrown hairs. It is perfect for both men and women and can be used in the most sensitive of areas because it is 100% Natural. 100% Natural. Moisturizing & non-comedogenic. Enriched with vitamins A & E.
Made with nutrient rich, hemp seed & cold pressed seed oils. Scented with essential oils. No shaving creams, gels or soaps needed. Not shaving? Use as a high quality beard oil! Not just for men. Women everywhere are experiencing the 420 Glide phenomenon. Small batch blended in the U.S.A.